Sawyer’s 15 Ton Guided Strap Bender is the solution for weld inspection and tensile testing equipment; whether in the field or in the shop. This iron horse tester is capable of performing face, root or side bend tests. With the improved plating and powder coating for corrosion resistance, you can be sure this weld testing equipment will safely perform guided bend testing for years to come. 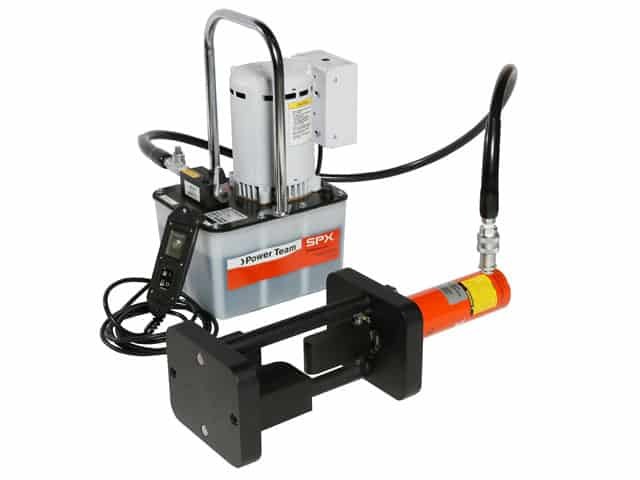 The 15 Ton Strap Bender is a highly portable piece of destructive weld testing equipment. The Strap Bender works horizontally or vertically, making it an extremely versatile guided bend tensile tester. With a .375 (3/8”) ASME die and plunger set that comes standard this iron horse tester is sure to meet all your weld joint bend testing equipment needs. Optional accessories for the 15 Ton Strap Bender, include .250 (1/4″) ASME, .500 (1/2″) ASME and 1104 API die and plunger sets and an Enerpac electric or pneumatic pump. Sawyer’s line of weld testing equipment combines the dependability of Enerpac hydraulics with Sawyer ingenuity and quality craftsmanship. These weld inspection machines are the first choice for many technical colleges, welding shops and pipeline inspectors because of the portability and ease of use. For the best in destructive weld testing equipment, Sawyer is the only option.